In 2010, Apple spent an estimated $420 million on advertising. Over 90% of that budget was allocated to network television, newspapers, magazines and billboards. Less than 10% went toward digital initiatives. And when Apple did spend online, it was usually an extension of a TV campaign like the iconic Mac vs. PC ads. Jobs also believed in controlling the message which files in the face of the current wisdom that consumers should tell the brand story via Facebook and Twitter. Upon his death, Apple barely had a presence on either platform. 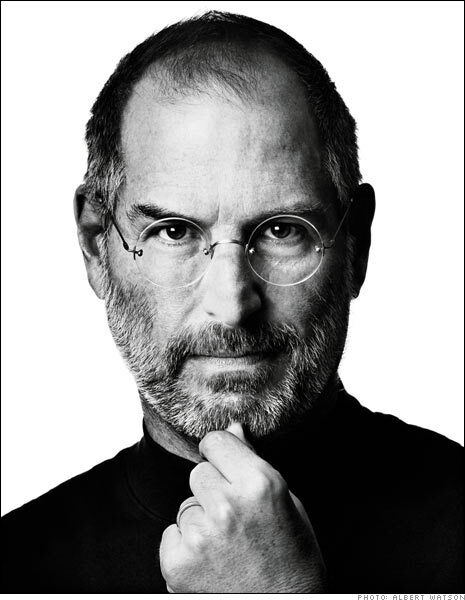 Throughout his brilliant career, Jobs created products for the masses. And he wisely chose mediums that targeted the masses. In advertising, as in product development, he relied heavily on his convictions and intuition. He did not rely on “likes” or “tweets.” He took a much more pragmatic approach: tell the story of how an amazing product can change a consumer’s life in the best environment possible. And then he was smart enough to understand that the best environment – then and now – is still traditional media. impact to your TV commercials. According to a study done by the Consumer Electronics Association (CEA), in 2010, 33% of U.S. households owned a smartphone. With that number estimated to skyrocket to 45% by 2012, advertisers are already starting to adopt the use of mobile applications in their TV campaigns. Brands like Tide® and Old Navy® have recently integrated the music identification application, Shazam® into current TV commercials. It’s simple too, no typing in long URLs or performing lengthy Google searches. The commercials feature songs, so all the consumer has to do is open up the Shazam® application and let it identify the song playing in the ad. From there they will have options to go straight to that brand’s website, purchase product, etc. With the Old Navy® ad you even have the option to buy the outfit the person is wearing in the ad! This new trend will not only make TV ads more interactive for consumers, but allow advertisers to more accurately measure the performance of the ads while tracking TV conversions. Integrating mobile apps into your TV advertisements works well all around – the consumer gets to interact with the ad while the advertisers are able to more easily direct traffic to brands’ websites. Shazam® is just the beginning; as this advertising tactic grows, the variety of applications available for integration will most likely grow as well. A new study from Innerscope Research and Fox Broadcasting Company has concluded that TV is powerful when it comes to making consumers receptive to brand messages – and it even makes online advertising more memorable. As most of us know, TV is great for its emotional appeal and its immersive environment allows audiences to be completely drawn into what they are watching. That engagement carries over to advertisements, and allows consumers to create the personal significance required for brand building and equity. This doesn’t mean that online advertising isn’t effective, but online ads are more effective once the consumer has seen them on TV first. The study determined that television ads across the spectrum of familiarity evoked 38x more emotional engagement than the same brands seen online. Even when the online ad was placed in a relevant environment, for example, an automotive ad placed on an automotive page, engagement was still 30x higher with TV. However, brand resonance of online ads almost tripled after a brand was viewed on TV first, as opposed to an online ad never associated with a TV ad. The two media have incredible power when used together: TV for establishing the brand message, and internet for reinforcing that message. 3D Technology: Should You Be Using It In Your TV Ads? Over the past couple of years 3D technology has begun to make its way into American homes. With an increasing number of 3D movies and games becoming available, advertisers might want to consider 3D television ads within the next few years. According to Chief Marketing Officer and General Management executive, Randall Beard and a late 2010 study conducted by Nielsen/ Cable & Telecommunications Association for Marketing Research Study, 48% of consumers said they were more engaged by watching 3D programming. It would seem only reasonable to expect that this heightened level of engagement will carry over to commercials produced in 3D. 1. 3D is automatically more immersive, making it probable that ads will be more effective. 2. 3D’s current technology requires the use of special glasses, which means if a person is watching TV in 3D they are invested in what they are watching, making them less prone to distractions and more apt to retain the messages in your ad. 3. Neural research shows that TV is #1 when it comes to communicating emotions, when compared to PC or Mobile platforms. The 3D feature would only amplify any emotion or action driven ad. With only a couple of 3D ads produced so far, the attention grabbing novelty is still ripe for advertisers. However, like every new technology, it will take 3D some time to completely penetrate the market. So don’t rush off to buy your 3D glasses just yet, but sure keep it in mind. It just might be the next big thing. 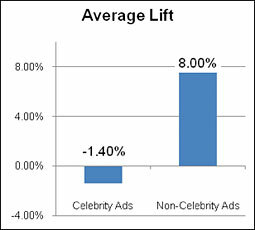 ﻿One would expect TV ads featuring celebrity endorsements to deliver better results than commercials without them. Everyone knows that the tried-and-true celebrity endorsement is the simplest way to maximize advertising effectiveness, right? Ace Metrix, a national company that tracks effectiveness of TV advertising, paints a much different picture. “We studied every nationally televised ad for the first 11 months in 2010 and found that celebrity ads performed either below average or merely equaled it,” said Ace Metrix CEO, Peter Daboll. “We found with rare exception, celebrity endorsements were largely ineffective and failed to yield the benefits popular wisdom promises. So why are today’s consumers not as easily impressed by celebrity hucksters as they once were? The study conducted by Ace Metrix reports that today’s consumer is informed, time-compressed, difficult to impress, and is only influenced by ads that provide relevant information. They are more likely to be influenced by someone in their social network than a contrived celebrity connection. Simply put, they don’t want products pushed at them, even from a celebrity. The study also points out that most celebrity ads lack the two key ingredients that consumers want most: relevance and information. It’s also important to note that consumers polled in this study overwhelmingly cited being “confused” about what product the celebrity was endorsing as a reason for celebrity TV commercial ineffectiveness. It appears consumers prefer commercials that clearly extol product benefits which could have a relevant connection to their lives; opposed to commercials from insincere celebrities that do little more than insult their intelligence with convoluted messages. Imagine that, going back to where we were so many years ago, when TV advertising actually did more than amuse and entertain. Celebrities or not, the new era of TV advertising, may not be that new after all. In an industry that’s driving money into social media and other communication platforms Joel Ewanick, the head of marketing for General Motors, believes some of the best campaigns still begin with Television. In July, approximately two months after Ewanick joined GM, the company aired its first Chevy Corvette TV commercial in five years. The spot, titled “Still Building Rockets,” contrasts NASA scientists developing and launching space rockets with a Corvette being built and burning rubber on a test track. According to Ewanick, Chevrolet will unveil a Silverado pickup TV campaign in October, which features the good-natured teasing that occurs when Silverado owners visit with owners of other brands. Additionally, GM will be returning to run Super Bowl advertising in February. Ewanick believes TV remains a key medium for selling and driving traffic to dealer websites. According to Automotive News, Ewanick – who spent about the past three years as Hyundai Motor America’s marketing chief – said he likes the current Hyundai “Uncensored” campaign. In it, Hyundai test drivers give straightforward opinions about how they feel behind the wheel of the vehicles. “That campaign began on TV then moved to Facebook and other social media sites to continue a lively dialogue for Hyundai owners and others,” Ewanick said. That’s a good model for how a campaign can launch on TV and expand into other media, he added. It’s important to remember that commercials should be written by copywriters, not mystery writers. Yes, they can be clever and artsy, but a commercial’s main objective is to sell a product or service. A recent Adweek Media/Harris Poll of 2,163 adults found that 21% often found TV commercials confusing with just 14% reporting that they never find commercials confusing. 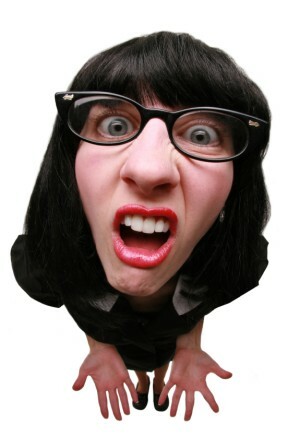 Boring, mundane … I can accept, but confusing?? In this new economy where every dollar must work harder than ever, advertisers can little afford to leave 21% of the audience in the dark on what they hope to be selling them. If consumers watching these commercials are unsure of the main focus of the message, do you think that might be a problem? TV commercials need to be entertaining and informative. Unfortunately, as this survey proves, there are too many agency creatives who apparently would rather be writing an episode for Lost then selling the products that pay their salaries. It’s a fact, in these trying economic times; people are cutting back on purchases. Advertisers (and the agencies that work for them) need to do everything possible to convince consumers that their product is worthy of consideration. If not, maybe it’s time to consider a new agency? Welcome to TV Is Not Dead – an ongoing resource for those interested in getting better results from retail TV advertising. Trends, tips and insight on what is still the most effective advertising vehicle anywhere! TV Production Terms: Everything You Wanted to Know But Were Afraid to Ask.